These are delightful warm, or at room temperature. They freeze well and are ideal for a snack, main meal, picnic or lunch. After I posted the picture on Instagram, I had lots of requests for the recipe. So I thought I’d pop it on the blog. The recipe is from Arto der Haroutunian’s classic book: Vegetarian Dishes from the Middle East which I highly recommend. If you click on the picture below, you’ll be able to download a pdf version of the recipe. I recommend that you wrap the pastry in cling film or baking parchment and chill in the fridge for 30 minutes or so. The pastry is quite sticky and difficult to deal with at room temperature. You can re roll the cutting scraps of the pastry to make sure you don’t waste any. We had some pastry left over when all the filling was used. So we rolled it out more thickly (say 3mm or so), cut them into biscuit shapes, pricked them with a fork, glazed with egg and baked for 20/25 minutes. They make excellent cheese biscuits. You could sprinkle the top with some salt flakes or seeds after you glaze them. 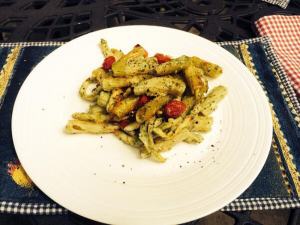 I lightly salt the courgettes after grating to help bring out the water so you don’t end up with a soggy filling. As you can see, I’ve varied the filling ingredients with fresh herbs and added the courgette flowers. Dill, lemon thyme and pine nuts would go well too I think. Have a play with the ingredients while keeping to the ratio of courgette to cheese. I made these loaves yesterday using kefir as a leaven. I received quite a few questions on Instagram about how I use the grains, so I thought I’d put up this post with some ideas. I’ll also include below the recipe for these particular loaves. Kefir is very interesting stuff and very useful. Here’s a picture of the grains. They feel sort of rubbery – a bit like Copydex when you make it into balls (you -did- do that didn’t you?). They come in all sorts of shapes and sizes, some big flat discs, some little bobbles. It’s a very special sort of organism called a ‘SCOBY’: a symbiotic culture of bacteria and yeasts. The bacteria are mostly lactic acid bacteria and these coexist and work together with the yeasts. The lactic acid bacteria convert sugars into lactic acid and carbon dioxide. The yeasts do the same, producing carbon dioxide and very small amounts of ethanol. The acidification of the milk means that the curds and whey separate out. As you can see starting below. Here’s our breakfast drink production. This is about 500ml of milk with the grains. Here the milk has been on the grains for about 5 hours. We strain off the grains in the morning and top up the milk and leave at room temperature. 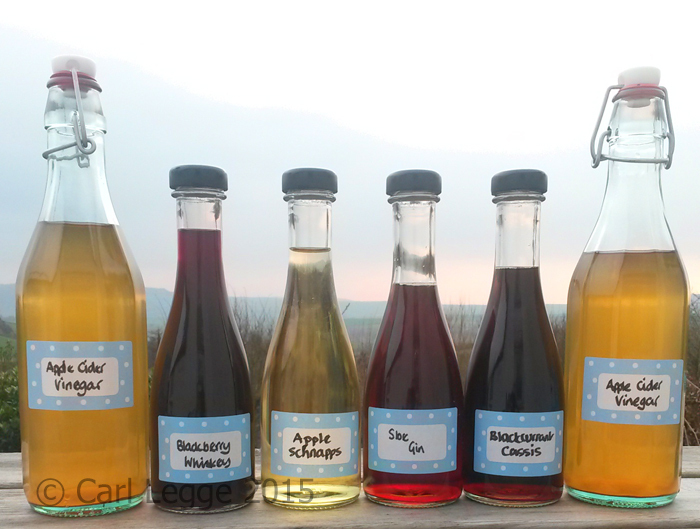 In the winter, we often flavour the milk drink with home-made rose hip or blackberry syrup. The drink is slightly tart and sometimes a little fizzy. The kefir is also great used to make smoothies. The grains readily multiply. So we either give excess grains to friends or pop them on the compost heap. It’s the actions of the lactic acid bacteria and the yeasts that mean you can use the kefir to leaven bread. Instead of feeding on the sugars in the milk, they feed on the flour. This makes enough for 2 loaves of approximately 750g each. Start the poolish the afternoon before you want to bake. 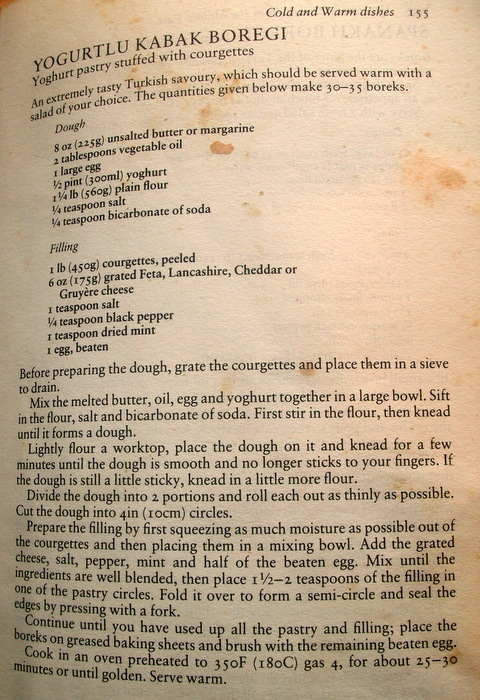 Mix all the ingredients together in the bowl you’ll mix the dough in (saves on washing up). Cover with plastic or a damp tea towel. Leave in a warm place until the next morning. The date syrup or honey gives the kefir a quick sugar rush to get the leaven started. By the morning, you should see the poolish slightly bubbly. Then add the other ingredients and knead in your Kenwood Chef or similar for 6 minutes or do it by hand. Cover again and allow to rest for 2 hours or so. 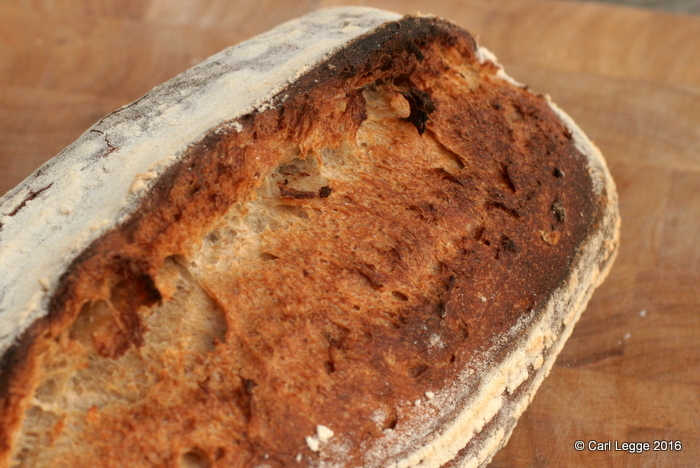 Then fold as I show you in this post for pain de campagne. Cover and rest for an hour: fold again. And finally cover and rest for another hour and then fold. Cover and rest for an hour. Divide the dough in two. Shape to your fancy – there’s some shaping tips in a video in the pain de campagne recipe above. Allow to prove for about a couple of hours. And while this is happening, preheat your oven to 230°C. Slash the bread artily. Bake the bread for 15 minutes at 230°C with some boiling water in a tray at the bottom. Then take out the tray, turn down the oven to 190°C and bake for a further 30 minutes. I use the kefir to culture cream to make cultured butter. My recipe for this is here. You can also use the cultured cream like crème fraiche. If you culture milk/cream until it splits into curds and whey you can make cheese. Strain the curds through muslin until you achieve your desired consistency. This is like a ricotta/labneh. It’s very good made with goat’s milk. You can add salt and herbs, chilli or other spices to taste. If you press the cheese in a strainer or cheese basket (use a cheese press or some heavy weights like a bagged brick or tins) you can make a hard cheese which you can age. 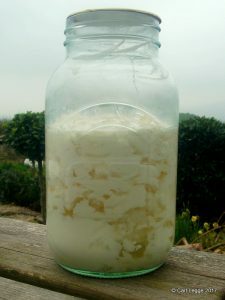 The kefir grains will also ferment other ‘milks’ such as coconut and almond. If you want to delve deeper into the mysteries of kefir, visit Dom in Australia who is a mine of useful information and bad puns. 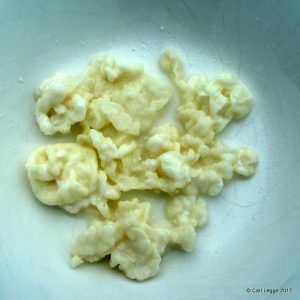 Here’s his page on Dom’s kefir cheese pages to get you started, but do explore further. Over on Instagram, my friend Carla has created something of a stir with her bread. As you can see below, Carla has made beautiful pain de campagne to a recipe I developed using some of the great bakers’ ideas as my inspiration. 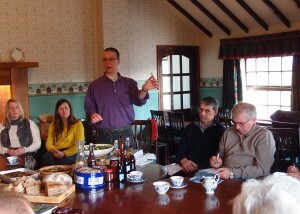 I recently led a workshop for local tourism businesses on how to use foraged foods in their offerings. The workshop was organised by Snowdonia Active a regional green business organisation. The aim of the workshop was to inspire the attendees to give visitors a ‘Taste of the Llyn Peninsula‘ by using locally provenanced wild food. The event was packed and we had a very stimulating 3 hours. 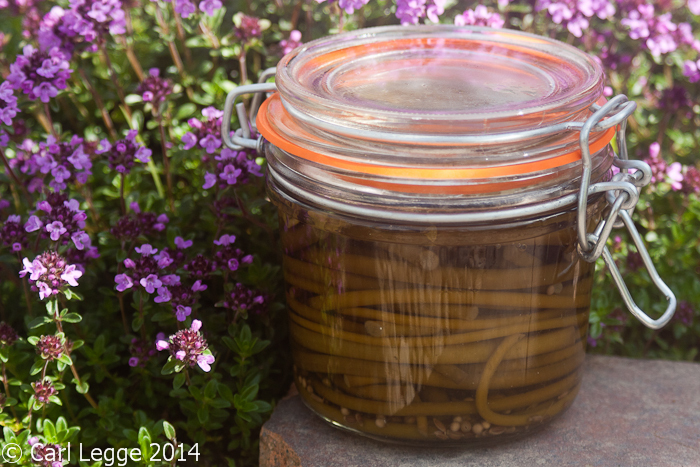 I made a selection of foods with foraged ingredients and brought along jars and bottles from my store cupboard. The final dish I presented was Gorse Ice Cream made from flowers picked from our fields. It went down extremely well indeed. The aroma of the flowers is of coconut or almonds but the finished dish has a unique and very hard to place taste. It’s well worth a go and it’s very easy to make, so I’ve put the recipe below. This makes about 1 litre (1 1/2 pints) of ice cream. It’s best made the day before you serve to give it a chance to freeze. Put the gorse flowers and milk in a saucepan, stir well. Heat to just below boiling, then turn off, cover and leave to cool for an hour or more so the flavour infuses into the milk. 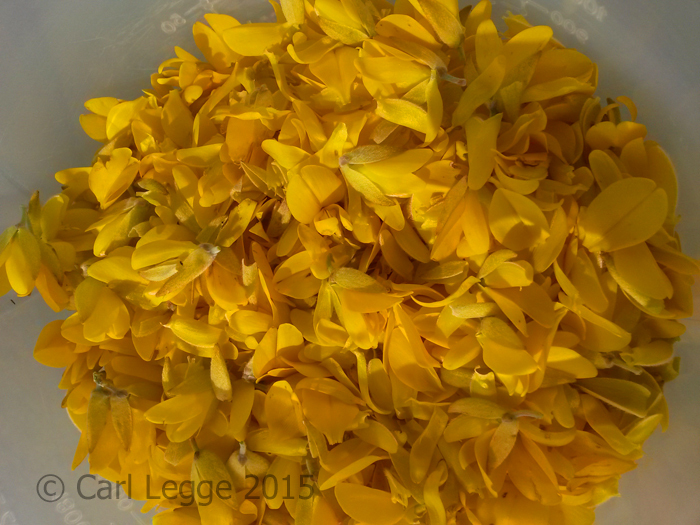 Once the milk is cool, strain off the gorse flowers using a sieve and return the milk to the pan. Compost the flowers. Whisk the egg yolks & caster sugar together in a bowl. Set aside. Pour the cold double cream into a bowl bigger than 1 litre (1 1/2 pints) and put the sieve over the bowl. Bring the milk to the boil and then whisk this into the egg yolk mixture and then tip all of this back into the saucepan. Heat gently up to a simmer so that the mix just coats the back of a wooden spoon. Don’t boil or cook until the custard is thick. Tip the custard through the sieve into the cream and stir well. Pour into a container you can then pop in the freezer. Freeze until set, overnight is best. You can stir the half frozen ice cream if you remember to get a smoother texture. Pop the ice cream in the fridge for 30-40 minutes to soften before you serve. Once you know how to make carrot top pesto, you’ll never want to waste your carrot ‘greens’ ever again. My recipe appeared online and then in my book The Permaculture Kitchen. Since then, I’ve seen carrot top pesto used by loads of people in all sorts of creative and scrumptious ways. I thought it’d be good to collect some of those ideas together as a source of inspiration. 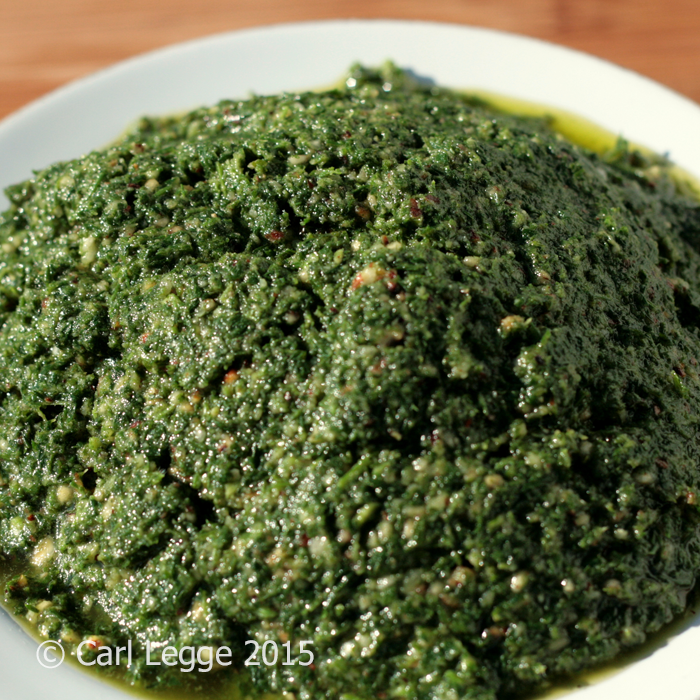 The recipe for the carrot top pesto aka ‘CTP’ is at the bottom of this post. 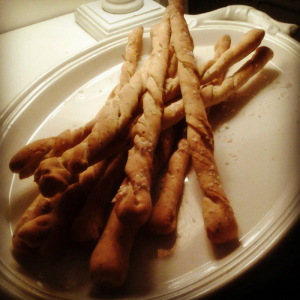 Carla Tomasi made these delicious bread sticks with black pepper and CTP spread over the dough before she twisted and baked it. Ideal with drinks and antipasta. Also good is the CTP spread on bruschetta or toast with one or more of cheese, olives, veg, anchovies or shellfish. Thane Prince used the CTP to dress penne in this scrummy pasta bake with cherry tomatoes. You can just as easily just mix it through cooked pasta: just leave some of the cooking water in the pasta to help make the ‘sauce’. Or use it with ricotta or mascarpone filled ravioli or other filled pasta. Peas go well in the stuffing. Francoise Murat spread the CTP over the base of a puff pastry case and filled with tomatoes and delicious vegetables. Just bake till tender. Easy- spread on puff pastry, add roasted tomatoes (vinegar+sugar+oil), peas +vegies, mozzarella bake 20 mins = trop trop bon! 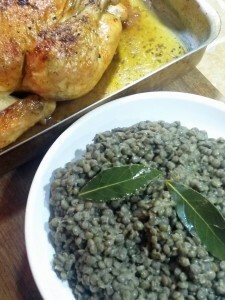 CTP is ideal mixed into risotto or with farro/bulgur and other grains. I love CTP spread on all sorts of veg including potatoes, oca, mashua, aubergine, courgettes, carrots (! 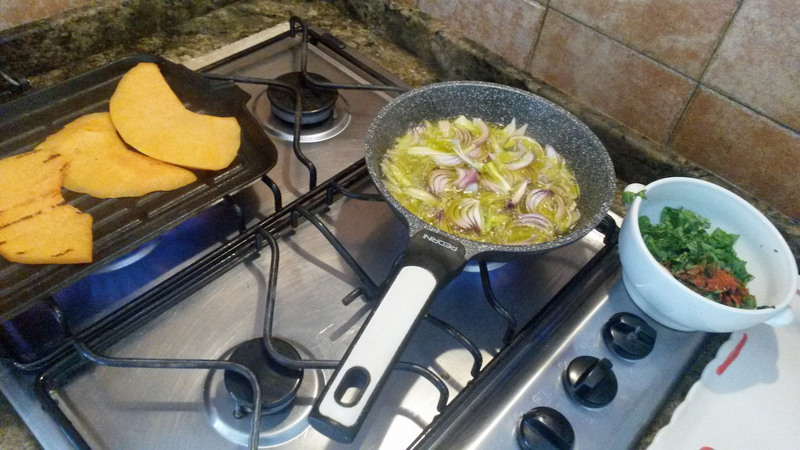 ), parsnips, onions which are then roasted. Use as a filling for that warming baked potato. CTP is delightful spread on all these to roast, grill or pan fry. Stuff it under the breast skin of a chicken before roasting. Slather on salmon before you grill it. Pop a blob on a juicy steak as you serve it. Feel free to scale the recipe to suit what you have available. It’s important that you use the young, tender carrot tops. The leaves & stalks from larger ones tend to be a bit tough. 50g whole almonds (it doesn’t matter whether they are blanched or not) Hazelnuts would work well too. If you need to, wash the leaves to get rid of any mud and grit. Pop them in a big saucepan over a high heat and pour over a large splash of boiling water. Cover the saucepan and boil for 2-3 minutes until the leaves are just wilted. Strain in a colander and refresh with cold water to stop them cooking. Drain completely and squeeze out as much liquid as you can. If you don’t need to do this, then you’ll get a fresher result. Dry roast the whole almonds in a heavy based pan or in the microwave until they are nicely browned. Cut the garlic cloves into slightly smaller pieces which will help them blend evenly. Put the almonds, garlic and a small amount of the carrot leaves into a food processor. The carrot leaves help the other ingredients process well. Process until the almonds and garlic are finely chopped. Add the rest of the carrot leaves and process until they are puréed. You’ll probably need to scrape down the sides of the processor a few times to ensure even processing. Add the parmesan cheese and process until well mixed, scraping down if needed. What you’re going to do next is to add the olive oil to make a fluid paste. Add it gradually, stopping to test consistency and scraping down the sides. The consistency I was after I call ‘falling over’ consistency so that the pesto just falls into the blades of the processor as it turns. So, with the food processor running, gradually add the olive oil until you get your desired consistency. Then check for seasoning. I added a good grind of black pepper and a couple of pinches of sea salt and processed that in. Keep in the fridge covered in oil. We spent a very happy few days in Ostia Antica near Rome with Carla Tomasi earlier this month. We ate like royalty and had lots of fun cooking with, and learning from, Carla. 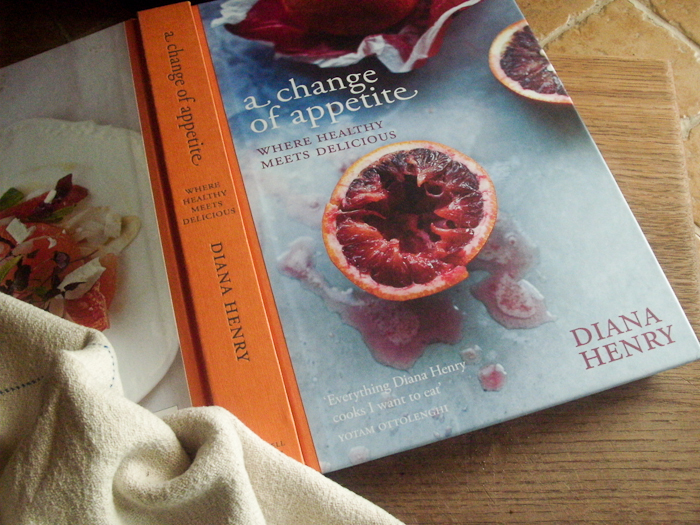 I’ll share some of the recipes in the coming weeks as I recreate them from my notes. 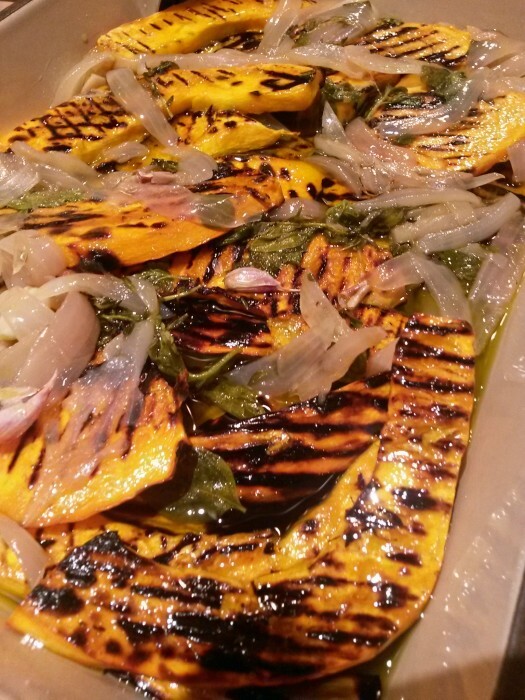 The first recipe is for griddled, sweet and sour marinated pumpkins or squash – aka, in Italian, zucca in agrodolce. As it happens, Carla was reminded of this Sicilian recipe by Rachel Roddy whom we also met there for a grand day in Rome. Rachel was very kind to give us a swift tour around Rome in torrential rain and a tour (and lunch) in Testaccio where she lives. As with everyone we met in Italy, she and her partner Vincenzo were incredibly generous. Look out for Rachel’s first book Five Quarters: Recipes and Notes from a Kitchen in Rome which I’m very much looking forward to. Carla varied the recipe by including some mint, parsley and a little chilli when she put in the vinegar. I used a mixture of Emporer’s mint and oregano. Carla and I used apple cider vinegar. At Carla’s we had it first with a Roman pan roast lamb and then next day as part of a huge lunch when another Testaccio resident Sigurd came for lunch. It tastes even better after a good chance for all the flavours to blend. I served it first with chicken and some dressed lentils. The next day, I chopped up the pieces so they were smaller and used it to coat some penne – molto bene. These sardines just melt in the mouth with a burst of herby flavour. They are a doddle to prepare and only take 10 minutes to cook. They are ideal as antipasto, as part of a buffet or a main fish course. I developed the stuffing from ingredients I had left over from the foraging workshop I did locally. So it was a real case of the available ingredients driving the recipe. In Italian ‘beccafico’ means ‘fig pecker’ a name for small, sweet plump birds. The dish is meant to mimic the taste of these birds. The stuffing is traditionally made with pine nuts, currants, anchovies, parsley, bread crumbs and lemon/orange juice and garnished with bay leaves. The fish tails are left to poke up out of the dish to simulate the perky birds’ tail feathers. This quantity would serve 4 as antipasto. Pre-heat an oven to 180°C (350°F). If it’s not already been done, cut off the head of the sardines and gut them. Wash & gently dry them. Cut from the gut to the tail to make it easy to butterfly bone the fish. If you fancy, cut or snip out the dorsal fin and cut off the tail. Put the fish belly down on a board so that the back is uppermost. Press down firmly on the length of the backbone and feel it separate from the flesh. 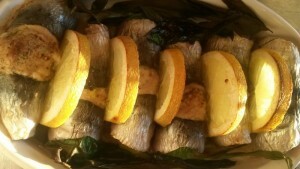 Turn the fish over and remove the backbone and rib bones, with luck they will come out as one. Use a small knife to help you if you need to. Mix the remaining ingredients apart from the extra virgin olive oil together so it makes a thick paste. Divide the paste evenly across each of the sardines. Roll up the sardines. If you want to mimic the birds’ tail feathers roll from the wide end first: otherwise it’s easier to roll from the tail end. 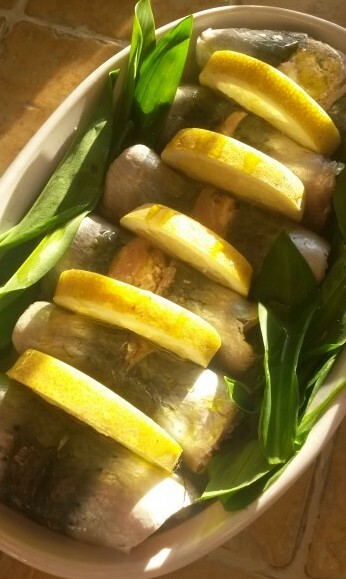 Put the fish tightly in a baking dish so they don’t unroll and put a slice of lemon between each. Drizzle over some extra virgin olive oil. Bake in the pre-heated oven for 10 minutes. The fish can be eaten warm, I prefer them at room temperature. Here at Legge Towers the weather has been just gorgeous since May. Which has made up somewhat for the slow and cold start to the year. We had to resow courgettes when the first lot sown in early March on heat succumbed to the less than stunning early May temperatures. So we’ve worked really hard outside for the last few weeks. 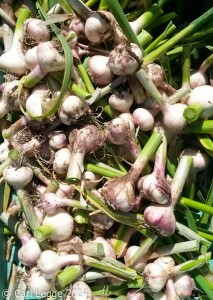 Our garlic has done very well and we harvested the lot this weekend. The best performing variety was a hardneck type (Allium sativum var. ophioscorodon) called Carcassonne. They’re great sized bulbs with a very good taste and developed great scapes. The scapes have a mild garlic heat & taste and they’re one of our summer treats. Use the scapes in the kitchen wherever you would use garlic. You use them in bean and vegetable dips, soups, stir fries, risottos, tarts and salads. They’re gorgeous moistened with some olive oil and barbecued, griddled or grilled for a minute or two. Just season to serve with a little sea salt and perhaps a splash of extra virgin olive oil. Yesterday, I used them to make a modified Sicilian style fritedda. Fresh picked broad beans, peas and artichokes are sautéed and then mixed with herbs, extra virgin olive oil and white wine vinegar. This was a book I needed. And I don’t mean ‘need’ in that “I’ve been a good boy and deserve a treat” sort of way. However I didn’t know it met my need until I read it. I bought it because I had been good and did deserve a treat. And what a treat it is. Why did I need it? I’ve been paying attention to the discussion about what constitutes ‘healthy eating’. 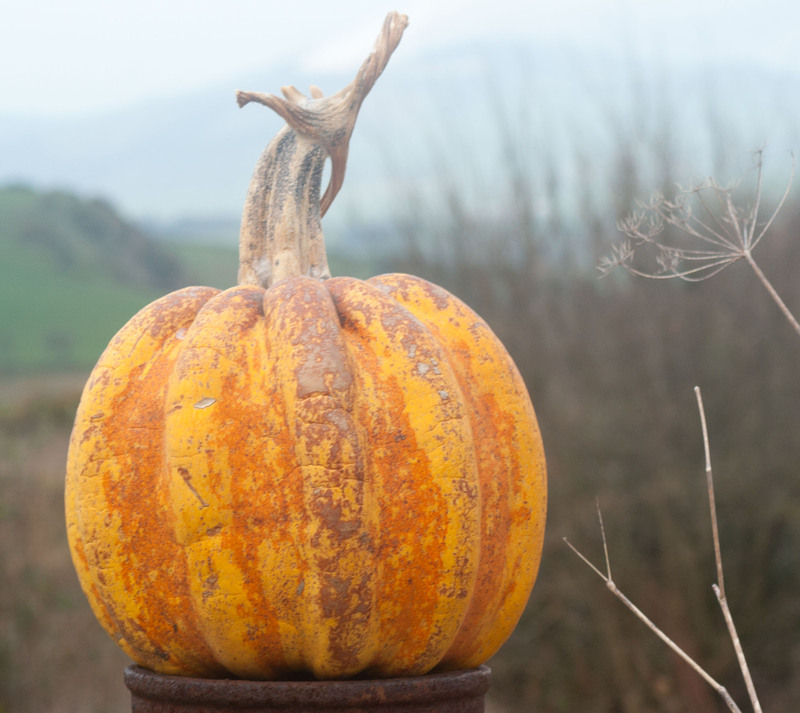 It was hard for me to navigate my way through the facts and fashion to an evidence based conclusion about what would constitute healthy and desirable food to grow, cook and eat. I wish I’d got to know mustard greens (and reds and goldens) much earlier in my growing adventure. They are such a tasty, versatile and good-hearted vegetable. And some of the varieties are great green manures, ground cover and biofumigants. 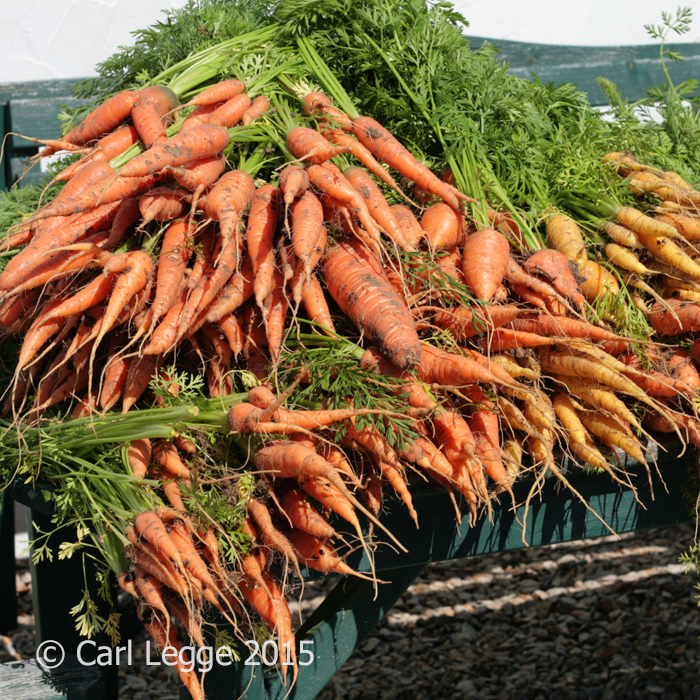 Here at Legge Towers we sow them in mid to late summer so that we can put them in the polytunnel to over winter. They get cut down by frost outside in winter, but in the polytunnel, sometimes with a little extra fleece protection they do fine. 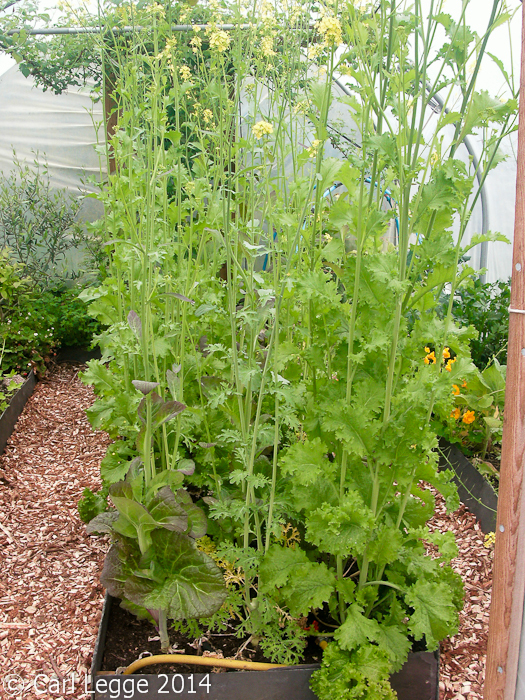 They make a good quick green manure which may survive a kind winter, but you can also re-sow early in spring. Certain varieties (like Caliente) are good before potatoes as the gases given off by the leaves when cut down can help prevent wire worm and other pests – this is the biofumigant. You need to cut down and work in the leaves quickly though. More info on this here. Just to say, we don’t tend to use them in the spring and summer. This is because there’s plenty else around and because we find they bolt quickly if it gets hot or dry for long (it does occasionally happen). The mustards give us with little leaves for salads to start with. Then we get bigger leaves to use in stir fries or as a steamed/wilted veg. You can also make a lovely mustardy pesto with them. In the spring they produce wonderful flower shoots to use like sprouting broccoli. Then, as you can see they climb! By this time, I’m thinking of the next crop that will occupy the space for the summer months. This year, I didn’t want to just compost the remains (after shredding the woodier parts). 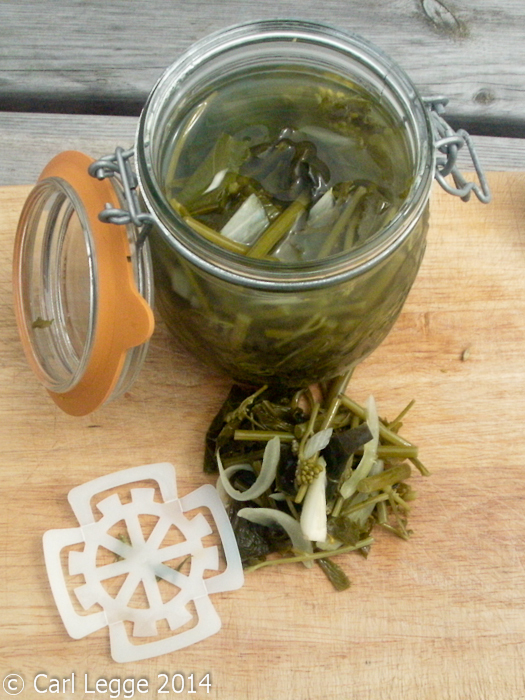 I thought I could use the more tender parts to ferment to make a tasty snack and accompaniment.